Women who are professionals with responsibilities and who, to most of the people around them, seem together and confident, brim with tears as they describe their feelings. The physical symptoms of Anxiety can be debilitating. Hearts pound, breathing quickens, people feel sick and sweaty. Our minds play tricks on us, making us think that everybody around us knows how we are feeling and everybody thinks we are weird in some way. 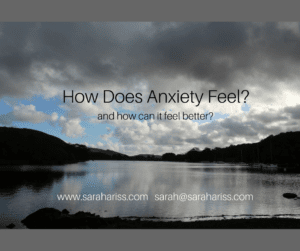 Clients have told me that they do everything to avoid situations where their Anxiety can be triggered. When to Seek Help for Anxiety. And people suffer in silence for years….. It’s often only when they can’t take any more that they seek help. If only they looked for that help earlier! There are ways to bring ourselves back to the way we want to feel, to bring ourselves back to be our best selves again, and sometimes to be someone we thought we could only dream of being. There are no rules and if we make the decision to ask for help we can start to make a change. We can start on the journey to be the person we always wanted to be – free of Anxiety and unnecessary fears. There are so many types of help out there, from Counsellors to Psychotherapists to Psychologists to the work that I do. Not every therapy suits every person, but every therapy suits someone. It’s just a case of finding the right therapist – someone who we can trust, feel comfortable with. I have written a blog post about finding the right therapist and if I can help in any way I’m happy to arrange a chat. Change can happen. This entry was posted in Anxiety and tagged cognitive hypnotherapy, cognitive hypnotherapy welwyn hatfield, help with nerves, help with stress, Hertfordshire, Herts Therapy Centre, how does anxiety feel?, how to choose a therapist, how to stop feeling nervous, hypnotherapists Herts, Hypnotherapy Herts, Hypnotherapy Welwyn, hypnotherapy Welwyn Garden City, hypnotherapy welwyn hatfield, personal growth, QCHPA, Quest Institute, sarah ariss, welwyn garden city. Bookmark the permalink.